The Legislature seemingly moved to within inches of adjournment Wednesday by advancing three of the final unresolved bills of the session, including a State Board of Education budget. But deep disagreements remain and the session will continue at least until Thursday, the 95th day under the Statehouse rotunda in Boise. After spending all morning meeting behind closed doors, the House returned and cleared its agenda Wednesday afternoon. It passed the final unresolved education issue of the year, House Bill 297, the 2019-20 State Board budget. The House killed the original budget proposal on March 7. Budget writers redrafted the budget and cut spending by $750,000, reflecting a separate House vote to kill Senate Bill 1029, a turnaround schools proposal. After skipping over the rewritten budget for the past week, the House passed it without debate. The budget provides $5.6 million in general fund spending authority, down 11.9 percent from the current year’s budget. $263,000 for the State Board to review master educator premium portfolios. $100,000 for Gov. Brad Little’s new K-12 education task force. Funding for 3 percent raises for permanent employees (each permanent employee will receive a $550 pay increase next year, with the remaining salary money distributed based on merit). The State Board budget passed 40-27, with House Education Committee Reps. Dorothy Moon, R-Stanley, Judy Boyle, R-Midvale, Gayann DeMordaunt, R-Eagle, and Barbara Ehardt, R-Idaho Falls, all voting against it. The four House Education members did not explain their votes, but there was considerable friction between some members of House Education and the State Board this session, particularly during a contentious rules review process in January and February. The State Board budget next heads to the Senate for consideration. Only a handful of issues stand between the Legislature and adjournment — including hemp, funding for new House offices and a wonkish and contentious fight over administrative rules that does have education implications. As Wednesday’s sessions wrapped up, the House and Senate appear deadlocked over the rules review process. The House passed Senate Bill 1205 — a “drop-dead” end-of-session bill that formalizes the Legislature’s work to approve agency rules. But along the way, the House added a big twist, reigniting a House-Senate battle over the rules process. The House inserted language that would require both houses to sign off on new agency rules. The language comes straight from House Bill 100 — which the House passed on Feb. 15. The Senate has never acted on this bill. And on Wednesday, the Senate again showed its disdain for the House’s plan. Senators quickly voted 31-0 to reject the House amendments, which effectively kills SB 1205 for the session. The House and Senate have been at odds over rules all session. Some House members have openly grumbled about the current framework — which allows rules to pass with the blessing of either a House or Senate committee. This, say House members, has given the Senate the ability to override the House. One talking point in this dispute is school science standards. In 2018, after a three-year debate, the Senate adopted the science standards in full, rejecting a House attempt to strike language pertaining to climate change. The session is the longest since 2009, when legislators toiled for 117 days. The session has gone on so long that more than 10 percent of the legislators were absent Wednesday. The list of 11 absent lawmakers includes Senate President Pro Tem Brent Hill, R-Rexburg; House Education Committee Chairman Lance Clow, R-Twin Falls; Senate Education Committee Vice Chairman Steven Thayn, R-Emmett; House Health and Welfare Chairman Fred Wood, R-Burley; Rep. Wendy Horman, R-Idaho Falls; Sen. Janie Ward-Engelking, D-Boise; and Sen. Cherie Buckner Webb, D-Boise. And some familiar faces in education circles are now serving as substitute legislators. State Board member Debbie Critchfield is substituting for Wood, while Boise School Board member Beth Oppenheimer is substituting for Ward-Engelking. Substitute Sen. Beth Oppenheimer (left) and Sen. Maryanne Jordan on the Senate floor Wednesday. Oppenheimer, who previously applied for a vacant Democratic Senate seat in 2013, was serving as a substitute legislator for the first time. She used her temporary position to highlight Week of the Young Child, an initiative from the Association for the Education of Young Children. “It is a time to recognize our youngest children, their families and thank those who work with and care for them,” Oppenheimer said on the Senate floor. “When children build together they explore math and science concepts and develop their social skills,” she said. Oppenheimer serves as executive director of the Idaho Association for the Education of Young Children, and took vacation time from her position to serve in the Legislature this week. 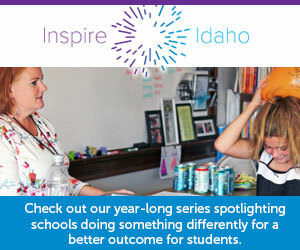 For years, Oppenheimer has been one of Idaho’s leading advocates for early childhood education.